We all love a great meal. Figaro, the first Filipino coffee company introduced their new Classic Favourite Meals; Salisbury Steak Burger and Beef Broccoli Stir Fry. I dropped by Figaro Tomas Morato branch last week to try all these. I was expecting a friend for a business meeting but the circumstances led to me indulging in these heavenly meals alone. 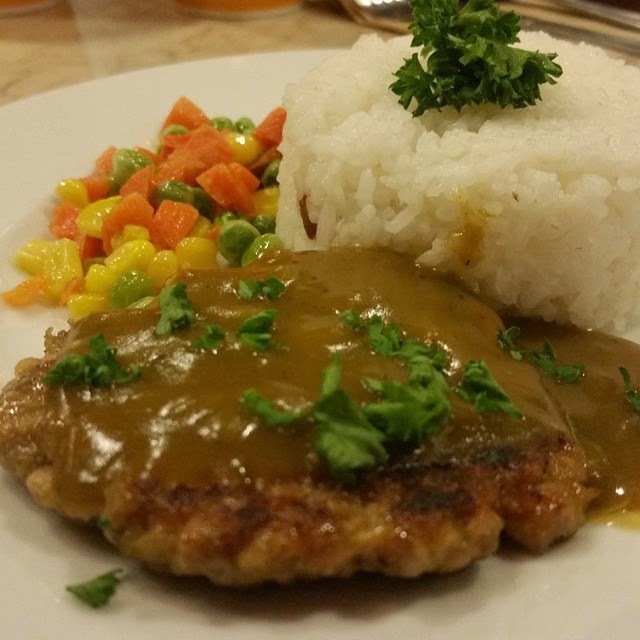 Served with a cold iced tea Figaro's Salisbury Steak Meal is a plateful of lean beef meat fried just right drizzled with Figaro's own recipe of sauce with corn, carrots and peas for only Php229. It's quite heavy for the weight-watchers but the fact that you're eating one complete meal with vegetables gives you the confidence that it's also healthy. Not too salty or spicy, Figaro's Salisbury Steak Burger Meal is one beautiful and filling comfort food for those who had a bad day at the office. I was happy about the new addition to the menu since it had always been my son's favorite meal any time of the day. It's also the Salisbury Steak Burger Meal that I've imagined, all complete with veggies perfectly matched with a cold cup of iced tea. Beef Broccoli Stir Fry was a bit spicy and tangy with quail eggs, baby corn and broccoli topped with sesame seeds for that extra kick of nutty flavor. 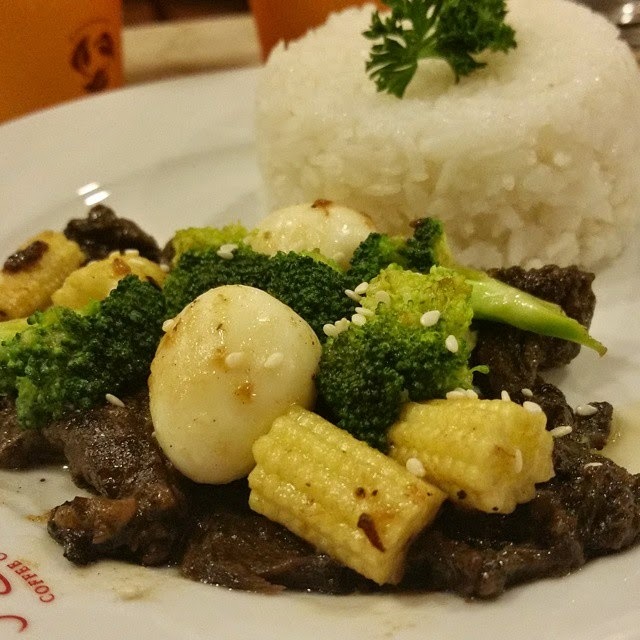 I loved the sweetness of broccoli and baby corn melting with the tasty beef stew on my mouth. It was even better than those I've tried in Chinese restos. Finally, when I saw this on the menu, I just have to take a quick bite at least before I pack it for take-away. Figaro's new All-Day Breakfast is Gourmet Tuyo in Olive Oil. Served with a cup of brewed coffee, Gourmet Tuyo In Olive Oil is a plateful of everything I've wanted in the morning. Garlic Fried Rice, Tomato, Onion and Cucumber Salsa, Fried Eggs and that beautiful unscaled dried herring fried in olive oil on a bed of fried eggplant slices were just irresistible. I had to take a bite and I had to take more home. I loved that the tuyo/dried herring had no scales and it's soft-fried slightly in olive oil. It isn't the same tuyo my grandma served when I was young because it's not hard and it didn't have skin and bones. It was all tuyo meat perfectly matched with fried eggplant slices that gave that extra kick of sweetness with juicy and soury-sweet tomato, onion and cucumber salsa. 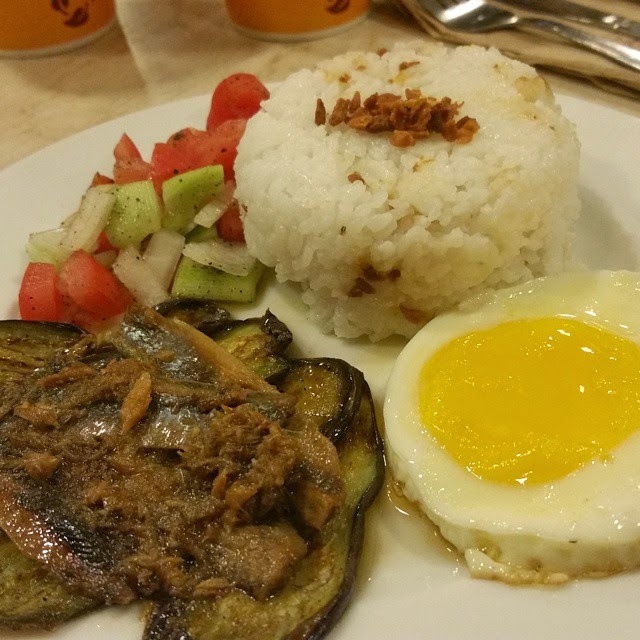 It was the breakfast I have always dreamed of, healthy, yummy and truly Filipino for only Php219. Thank you Figaro for bringing another favorite perfect with coffee available any time of the day! For more information, please visit www.figarocoffee.com and like their official Facebook page at https://www.facebook.com/figarocoffeecompany and follow @figarocoffeehq on Twitter and @figarocoffee on Instagram for more promos and updates.